Perfect for couples looking for something a little different; our sharing plates are served family style so your guests can get involved! Sharing plates have revolutionised the way we eat and even think about food. Sharing plates became a concept a few years ago – with the arrival of posh tapas. Then Russell Norman’s seminal restaurant Polpo arrived in London, changing everything. Serving Venetian-style snacks, Polpo made bijou bites fashionable. Goodbye: the predictable starter, main and pud. Hello: little, tasty bites designed to share with companions. 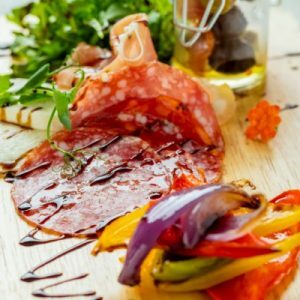 Charcuterie (French for ‘cold meats’) and ‘mini Puds’ are now commonplace on many menus, whether the establishment is a gastropub or restaurant. As we have become more European in our eating and drinking habits, largely due to more people travelling abroad and more restaurants adapting their menus, we are becoming more and more inquisitive when it comes to trying new foods. This trend just preceded the food Instagram revolution that now means we are sharing our meals virtually – as well as actually. Bloggers, restaurant-goers, chefs and restaurants are posting, sharing and are tantalising our taste buds with every post. The initial draw of having four or more plates on the table at the same time was that the meal became an informal version of a tasting menu, where we could enjoy more of the chef’s repertoire without the heavy price tag or the prospect of a long-drawn out meal. Sharing plates allow you to enjoy a more rounded approach to food and are, in part, responsible for shaping our eating habits. After all, sharing is caring!